Don’t despair! Hardscapes can help. Frost can damage concrete in many ways. Two of the most prominent are, having the frozen ground heave because of ice crystals forming in the soil, and collapsing due to these ice crystals thawing in the spring. When the weather becomes cold in the winter frost penetrates the ground and freezes water trapped in the pores of the earth. Water flows from wet to dry so water from below the frost line is drawn up. As it reaches the frost line it freezes. This eventually creates a thick layer of ice. The expansion caused by the freezing ice creates a layer that heaves the ground an equal distance of that layer. Finally the pressure below the concrete can no longer sustain its integrity and cracks. 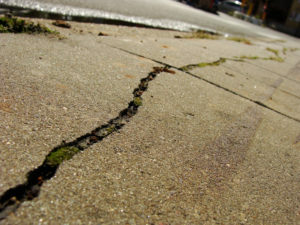 Filling these cracks can leave ugly jagged lines in your concrete drives and walkways. Professionals like Hardscapes Inc. have many methods of repairing just this kind of winter damage and bring your concrete outdoor surfaces back to their original beauty. Have questions? Want to arrange an no-obligation quote? Contact Hardscapes at 403-547-5597. « Time for spring projects!